First, there was the flirtation with former Alaskan Governor Sarah Palin. Then, when she didn't throw her hat in the ring, the new love became Minnesota Congresswoman Michele Bachmann. After that romance, there was a brief rebound affair with Texas Governor Rick Perry. 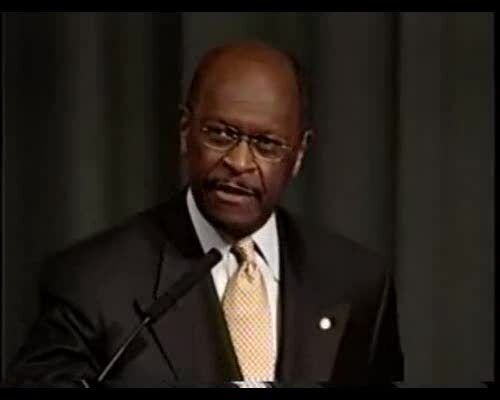 Now it seems like the so-called racist Tea Party has settled on a new favorite: African-American, former Godfather Pizza Executive Herman Cain. News out of Illinois this weekend is that Cain won the Midwest Tea Party Convention held in Illinois with over 75% of the vote. This was only a week after Cain won the Florida Straw Poll, beating out Perry (2nd) and former Massachusetts Governor Mitt Romney (3rd). It appears that Perry and Bachmann's slipping in the polls has benefited Cain, who is now show as tied for second with Perry with 17% in the ABC News/Washington Post poll released yesterday. After weeks of being second place, Perry's declining fortunes have put Romney back in the lead at 25%. I have long said that the Republican candidate left standing who is not named Romney will be the GOP nominee. I figured that would be Perry. While I still think the Texas Governor has time to regain his footing, he appears to be still stumbling. The irony is that with all the talk about the Tea Party members being racist, they appear to have coalesced behind the only African-American Republican candidate in the race. The election of 2012 could feature two African-American candidates as major party nominees. Whenever one points out true racists wouldn't support a black man for President, the response from the liberals is that Herman Cain is not really black because he is a conservative. That argument though undercuts the claim that the motivation behind the Tea Party is race instead of politics. It is insulting to think African-Americans must be monolithic when it comes to their views or they are no longer allowed to consider themselves as black. There are undoubtedly some racist Tea Party members, just like there are racist Democrats and racist Republicans. But it's time to can the nonsense of apply the broad sweeping racist label to a movement of people whose motivation, right or wrong, is obviously politics and not race. Another politician who holds rights in low regard. He believes that communities can bar the construction of mosques, and that Muslims should be required to take loyalty oaths. In short, he is an ideal candidate for right-wing bigots. I would vote for Cain, as I would Colin Powell. Powell's only ding in my opinion, is he supported the man who now sits in the White House. I am not a racist. I am a "human being", as are all other people on this planet. I firmly believe that too often, we put way too much emphasis on race, gender and religion instead of being humans. I do not vote along party lines, though I tend to be more on the right of center. I miss Great Presidents, instead of the so-so presidents. I also say that "one is only as free as the government allows for them to believe they are". The liberals expect for blacks to know their place, and when they don't posture they way they are supposed to posture, the liberals attack. So much for hard won civil liberty. As far as the liberals are concerned, if you are black you don't have the right to be conservative. I think Cain is a polarizing figure as far as Presidential politics go. He's got a good case of "foot in mouth" disease, and there's still some evidence to suggest he's doing little more than a vanity run. For example, the only two POTUS stops he has this month are for the two debates. The rest of the time he's promoting his book, mostly in states with late primaries. But if he finds the right Congressional district, or state in the case of a Senate seat, he could probably quickly rise in the Republican legislative ranks. I'm sure being 1 vote out of hundreds can be a bit of a blow to an ego, but it's more realistic than running for President with no political experience. Conservatives are just as twisted about race as liberals, so Cain earns their adoration by reviling the First Amendment. Imagine the conservative thrill if Cain had supported slavery and Jim Crow. Those views would have proven that he was independent of the Black consensus, not to mention a damned fool. Freedom in this country is not in trouble, it has collapsed, so a cretin who supports laws blocking religious worship and who would demand religious loyalty oaths is not laughed off the public stage. Cain's views make Al Sharpton seem comparatively reasonable, and that's not easy to do. IS, I'm not big on the Presidency being an entry level political job. We in Indianapolis here experienced a person with no political experience elected Mayor and there has been a consistent price paid for that. People who don't know what they're doing surround themselves with sharks who take advantage of that inexperience. So, PKO, you wouldn't have a problem with an experienced politician who advocated a prohibition on building mosques and loyalty oaths for Muslims? You subscribe to a sort of mystical libertarianism that doesn't seem to have any existential application. At least that the generous way of characterizing your professed beliefs.